In 1993 Gisele was 28 years old, married and expecting a baby. Following a miscarriage with her first pregnancy, this baby was perhaps even more precious. She was elated with the anticipation of motherhood and the thought of building a family with her husband. Having children was all Gisele had ever wanted; it was the reason she believed she was here on this earth. Motherhood was within reach. Since the day she went into labour, Gisele’s life has been shaped by shoulds. She should have delivered normally. When she did not, she should have had emergency obstetric care. Perhaps she should have had a C-section. She should have become a mum. But 20 years later in 2013, Gisele was 48, divorced and childless. During a prolonged obstructed labour in her Congolese village, Gisele lost her baby. Owing to the trauma of the delivery, she developed a condition called obstetric fistula, also called VVF. VVF is a childbirth injury that creates a hole between the birth canal and urinary tract, leaving the mother incontinent. For 20 years, Gisele lived with a steady stream of urine trickling down her legs. While the nature of Gisele’s condition was terrible, her physical pain was now nothing compared to the emotional burden that came with her husband’s public rejection. In her failed attempts at motherhood, she grieved her life’s purpose. In her failed marriage, her fear was confirmed – to be a woman unable to have children was to have no value. Gisele withdrew into a life of solitude, and described her existence as somewhere between life and death. Gisele wanted to take her life, and she knew the way she would do it – with poison. What would it be like to drink that last glass of liquid, knowing that she would not live to feel it dampen her skirt? But something kept her going, kept her alive. With surgery, obstetric fistula is often repairable. 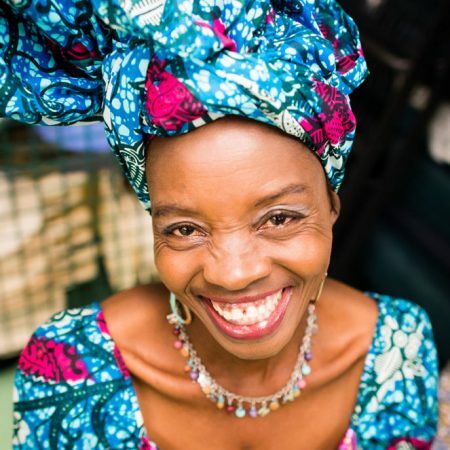 As news spread around the Republic of Congo that Mercy Ships was coming, Gisele began to hope. But she tried not to get her hopes up; she had been let down too many times before. It was not until she found herself sitting on a hospital bed in the port of Pointe-Noire waiting for surgery that she allowed herself to believe that she might be healed. Since her surgery, Gisele is all smiles. Gisele is glowing. When it comes time to discharge fistula patients, the Mercy Ships hospital throws a going-away party called a Dress Ceremony. Each patient is presented with a new dress, which she will wear as she goes home. On the morning of Gisele’s celebration, the women gathered in the ward to do their make-up and fasten their head wraps. The room filled with chatter, smiles and an energy like that of a bridal party. After the celebration was over, Gisele walked out of the hospital, down the dock, and took her first step re-incorporated into society. This moving story is taken from the website of Mercy Ships, the faith-based international development organisation that deploys hospital ships to some of the poorest countries in the world, delivering vital, free healthcare to people in desperate need. It seemed like a fitting story to tell this week as we in this country look forward to the 70th birthday of the NHS on Thursday, and give thanks for its founding ideals: that good healthcare should be available to all, regardless of wealth; that it meet the needs of everyone; that it be free at the point of delivery. Like almost all Jesus’ miracles the healing of this woman took place outside any community of faith. She was not one of Jesus’ close friends or relatives; we do not even know her name. She was just one of the poor, voiceless, marginalized, despised members of society that Jesus sought to re-incorporate. “Daughter” he says. Through Jesus’ noticing, this unnamed women became recognised as part of Jesus’ family. Most of us will not have the skill or power to effect physical healing. We do however all have the power to effect re-incorporation of those who are poor, voiceless, marginalized and despised by society; of those who may just be isolated and lonely. Take a look around, not just here, but outside. Who do we notice? Who do we not notice? Who do we notice but pretend we haven’t? Who is not represented? Is everyone welcome and safe? Just as 70 years ago Nye Bevan set out the founding ideals for the National Health Service, Jesus’ healing miracles set out the founding ideals for the kingdom of God: it is for everyone, free at the point of delivery.